​Hi I'm Ash, a game designer in Brisbane making things with awesome people. I've completed a Bachelor of Game Development at SAE Institute, where I collaborated with film, audio, animation and graphic design students to make a number of prototypes and form my foundations in game development. I gained a huge appreciation for the expertise in other disciplines as well as learning how to speak each of their languages. ​The majority of my projects have been based in Unity, including a mobile game that was released on Google Play during a 13 week unit. I take pride in attention to detail and always keeping the player experience in perspective. I believe that design decisions should be deliberate and that nothing created should be without purpose. I love creative constraints and the challenge of designing within them. In addition to becoming a half-decent game designer, my dream is to see Brisbane grow as a game development hub. The local community is vibrant, inspired and just the right amount of crazy. I regularly participate in local game jams, meetups and other local events, so hopefully I've already met you, and if not I hope I can have the pleasure in the near future. 'As part of my bachelor degree I completed an internship with local developer Screwtape Studios, during October-December 2016, working on 2D Action Platformer, Damsel. I was assigned the task of creating core content for a number of missions in Damsel using preexisting elements, such as enemies, hazards and collectibles. ​In addition to my daily tasks, I also was expected to fully participate as an employee. 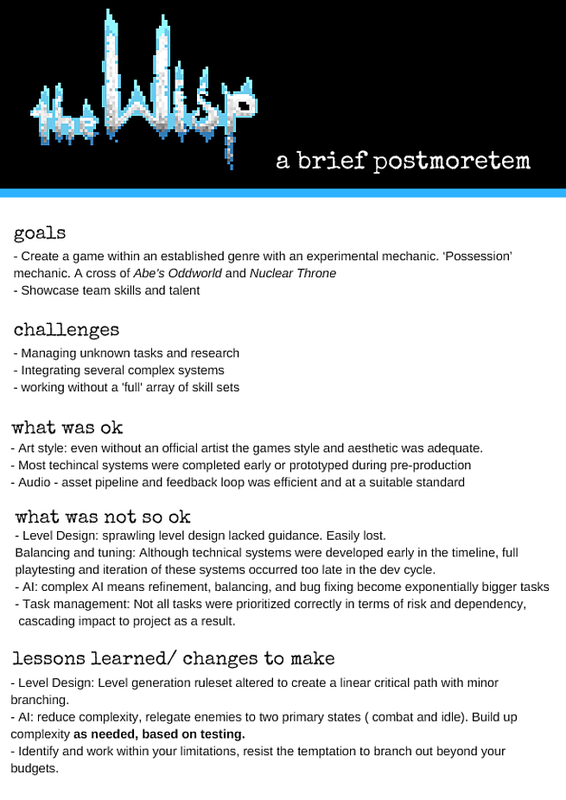 This included daily stand-ups, task/bug tracking and discussions on the game's design and development. Being able to work so closely with the development team was an invaluable experience and oppurtunity. A co-op platformer developed in Jan 2017 for local 48 hour game jam using 3 stimulus words as the inspiration: Vermilion, remedy and parallel. Each player can shine a light to reveal blocks of the same colour that are otherwise invisible and untouchable. Player's will need good timing and communication to collect the medallion in each level and activate the exit portal. The Lanterns team is now working to bring the game to a full release, iterating on the core mechanics and developing the title for PC with plans to deploy to Nintendo Switch in early 2019. A mobile puzzle game inspired by 'Lemmings', built during a commercial development unit at SAE. This project was completed over 13 weeks with collaboration from audio, animation, graphic design and programming students. The project was released on Google Play whilst maintaining a media presence, developer blog and shipping a feature update during the 13 week trimester. I created the design, content and managed the 7 contributors who made this possible in such a short time. Completed as part of an extended production unit, The Wisp aimed to combine a stealth mechanic with the fast paced gameplay of a shoot-em-up rogue-like. Although the project wasn't as polished as the team desired, many lessons were learned and the experience of working on a larger scope project were invaluable. 'Make a 2v2 game where one team member has instant actions and the other has delayed actions' was the brief for this studio 1 game. ​A ring out mechanic based on sumo wrestling inspired the core game play with each team comprising of a large stampeding titan partnered with a smaller, mobile titan that can temporarily stun enemies. The the biggest challenge from a design perspective was ensuring that the engagement and importance of each team member was similar, despite the difference in their roles.